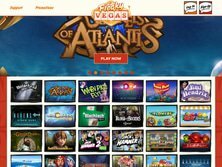 Freaky Vegas casino is a new online gambling site for Canadian players. It was established in 2016 and offers a clean instant play format with plenty of options. The Freaky Vegas casino bonus for new players is a 12 free spins no deposit bonus. When you register for a new player account you get 12 free spins straight away that can be used to play NetEnt's Starburst slot. All winnings from the free spins will be transferred to your bonus balance and this must be wagered 40x within 1 day before you become eligible for a withdrawal. This no deposit bonus is limited to a $10 cash out. It's a bit low for a no deposit bonus but it still means some risk-free gaming and a way to test out this new casino. When you make your first deposit you get a 100% bonus up to $100 plus an additional 100 free spins on the Starburst slot, Gonzo's Quest, Eggomatic, or Jack and the Beanstalk. The wagering requirements for this deposit bonus are set at 40x the bonus only and the offer is valid for 7 days after you make your deposit. That's not all that's on offer either, with your second deposit you get 50% up to $50. Regular promotions are also available including the 5000 free spins casino race which is a great way to earn monthly rewards on your favorite games. There are no codes required when redeeming any of the offers and there is a VIP club for players too. When compared with other NetEnt casinos this is an excellent offer, especially for a new casino. Freaky Vegas online casino is still very new and while players from Canada are allowed, there is a large number of restricted countries. These include the United States, Spain, United Kingdom, and more. The full list can be found on the casino website. FreakyVegas casino is an instant play no download site with games available for both PC and mobile. The mobile casino is provided by NetEnt Touch and players have access to all the best slots on their smartphone and tablet with no download required. The software used includes NetEnt, Playson, Euro Games Technology, and Portomaso Gaming. Players have access to some of the best slots in the industry with NetEnt video slots being the most popular. These games have superior graphics and some great features. The most popular titles include Jimi Hendrix, Twin Spin, Wonky Wabbits, The Wish Master, The Invisible Man, and more. Table games include several variants of blackjack and roulette. Unfortunately, there are no video poker games or specialty games so if you are looking for these you will be disappointed. There is a live dealer casino room where players can choose from several variants of live roulette and blackjack. 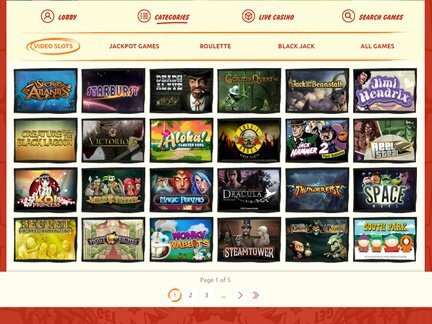 There are 8 progressive jackpot games. These are Arabian Nights, Cosmic Fortune, Geisha Wonders, Icy Wonders, Jackpot 6000, Mega Joker, Super Lucky Frog, and Tiki Wonders. There is no winner's page on the casino and no major jackpots have been won here yet. These aren't the biggest NetEnt progressives. Arabian Nights seeds at €125,000 and have been won a total of 18 times. The average win is €998,910 and the biggest win to date is €3,332,926. It is won on average every 19 weeks. As this casino is still relatively new, there have been no complaints filed. Customer support is available via live chat which is available from 10am to 11pm every day of the week. Help is also available via email and there is an extensive FAQs section on the website. The support agents are very helpful and you can chat to them in English, Finnish, and Swedish. Because support is not available 24/7, the rating for Freaky Vegas Casino is 4 out of 5. We will continue to monitor the site and update this section when necessary. Freaky Vegas casino was established in 2016 and is owned and operated by Glimmer Ltd. It is licensed and regulated by the Malta Gaming Authority which has the highest security standards in the online gambling world. The site uses state of the art SSL encryption which prevents player data from being accessed by any third party. The casino also features NetEnt slots which are highly regarded and their games are regularly audited by the Gaming Labs, a trusted independent audit agency. I found the overall experience at Freaky Vegas Casino very impressive. The Freaky casino bonus which is a 12 free spins no deposit bonus was easy to claim and there was no code required. The free spins could only be used on the Starburst slot and the maximum win was $10. It didn't matter though as it allowed me to test the software on both PC, mobile, and tablet, with great results. Depositing was a breeze too and that, in turn, came with a bonus and another 100 free spins on a number of NetEnt slots. The wagering requirements are low and there are plenty of great features included in the slots games. Playing on iPad, iPhone, and Android devices is great and there is no download required either. I really did enjoy testing out this new Canadian online casino and feel bad that their rating dropped to a 4 out of 5 because customer support wasn't available 24/7. If this changes I will be happy to give this casino a rating of 5.